Because sometimes it shows best that way. The shadows seem so mystical on the blue birdbath! The shadows in your birdbath are lovely. It creates such a feeling of tranquility. Lovely Michelle. I have a bird bath like that...but no piping angel. How serene and lovely! Beautiful photographs Michele. I love your bird bath and roses. Beautiful sights leaving a nice shadow. Love the roses next to the birdbath. I just LOVE this time of year! I love your roses and bird bath. 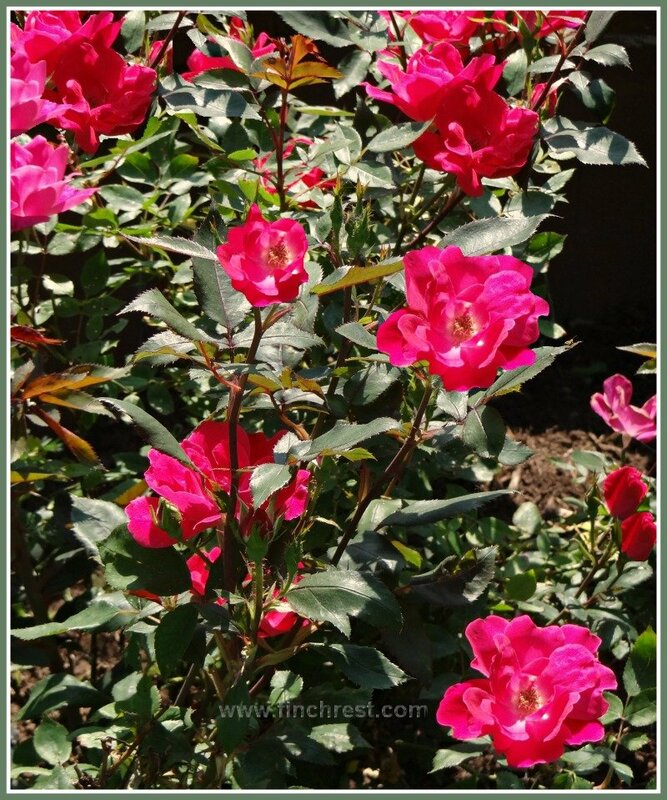 I can't wait for my rose bushes to be as lush and full as yours...just beautiful! I planted my new roses just in the past few weeks. Thanks for your visit and kind words. Have a wonderful weekend. So beautiful Michele. 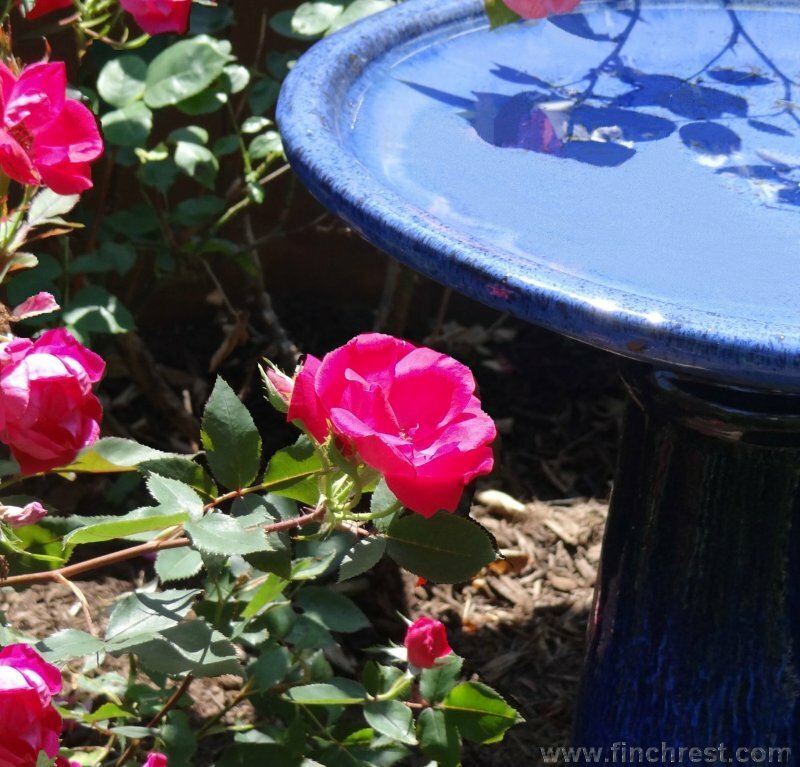 The rose is gorgeous and I love the blue of your birdbath. 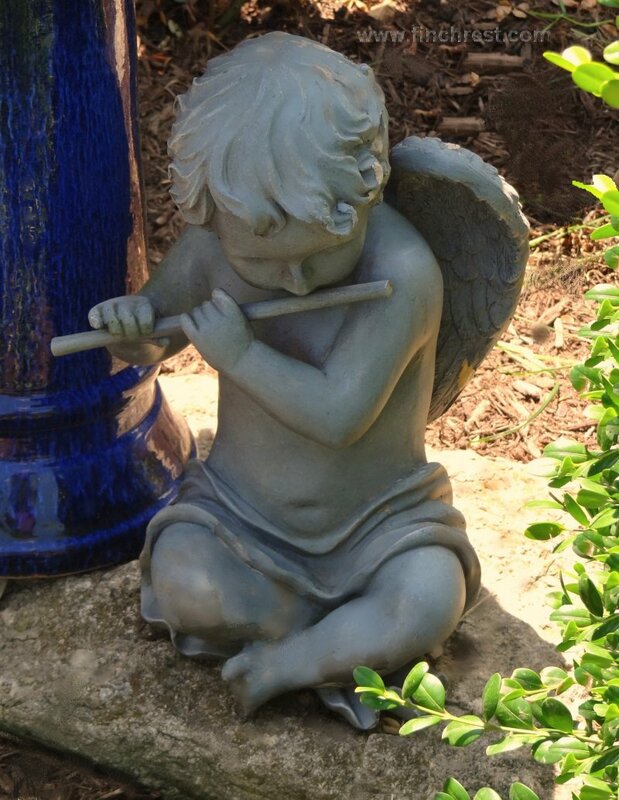 Sweet angel is playing a beautiful tune. Happy Sunday! Beautiful photos! Enjoy the rest of your weekend! You captured so much beauty in your photos. And you're right, sometimes you don't need words because the photos speak for themselves. Beautiful photos! You captured the perfect shadow. I love your blue birdbath. I love that, very creative. Delicious Shadows, have a blessed Sunday! 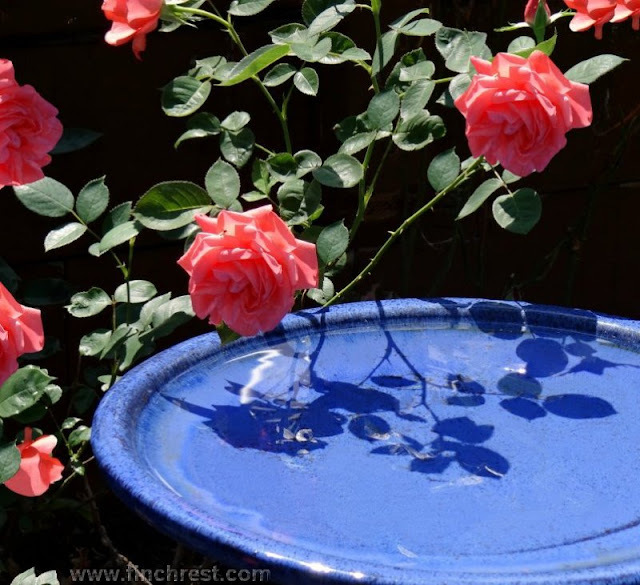 The rose shadows seem to be floating in the water of the birdbath. Lovely! I have that same little bird bath. Got mine at Tuesday Morning. That is a beautiful sight! Beautiful shadows of your roses. I am bestowing on you the Kreativ Blogger Award. Check my blog for the post. I am sending you an email if I can find your address. What a wonderful blue colour! Great photo's. Thanks for sharing your beautiful blue birdbath. 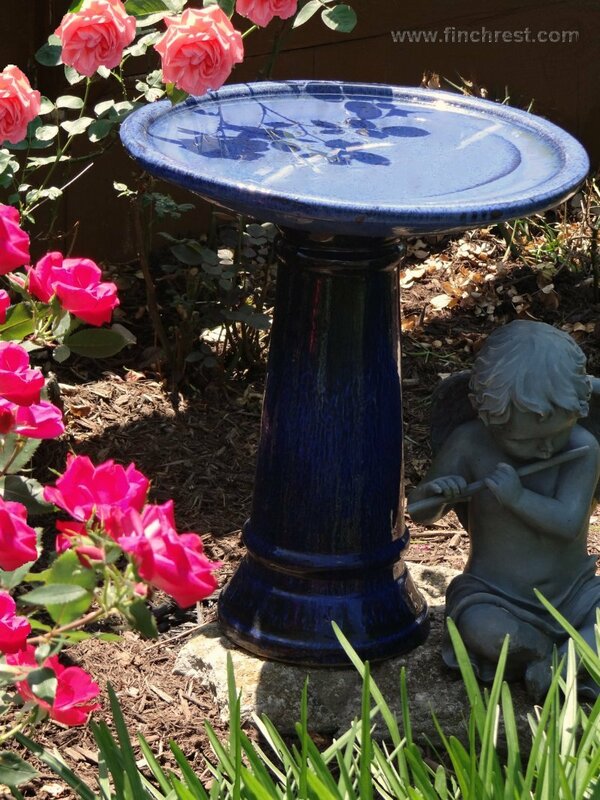 This is a beautiful spot for your birdbath! Lovely photos! No words needed! Your flowers are beautiful and I LOVE that birdbath!! 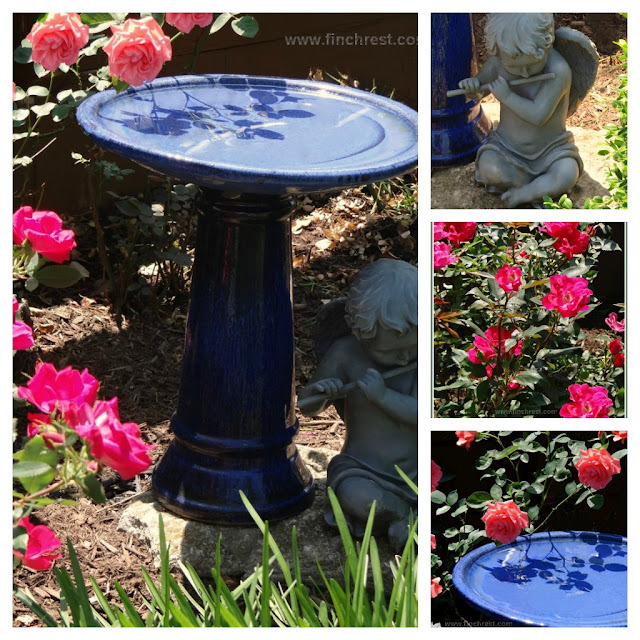 Oh my, I love the roses, the birdbath, the shadows and the darling angel! Who needs words with great photos like those? !